Ovid (https://en.wikipedia.org/wiki/Ovid) - full name Publius Ovidius Naso - is considered one of the greats of Latin literature, up there with Virgil and Horace. Certainly his 'Metamorphosis' is a great work, one that has influenced many other authors, Dante, Boccaccio, Shakespeare, Cervantes, Marlowe, Milton, Chaucer and so on. It's been some time since I have read that book, and I pulled this selection to see if it was of equal worth. I'm afraid not. The writing of the 'Metamorphosis' was interrupted by Ovid's exile to a small city on the Black Sea in CE 8. There have been endless suggestions and disputes about the reason for this exile, pronounced by Emperor Augustus personally without the intervention of any court. Near the same time Augustus exiled two of his own grandchildren and had the husband of one of them executed for a conspiracy against his life. Perhaps Ovid was a minor player in a conspiracy, or perhaps there are other reasons that might be suggested by his writings prior to Metamorphosis, writings such as the selection presented here. Augustus was something of a puritan, and it is on record that he struggled mightily to restore what he saw as the moral standards of an earlier Rome. Scandal touched even his own family as he publically complained about the infidelity of his children and grandchildren. No doubt Ovid could be seen as a contributor to this licentiousness. Before the 'Metamorphosis' his works consisted of love poems with a heavy emphasis on adultery. In fact it seemed to be his only subject. Aside from an excursion into a handbook on women's cosmetics all of his works dealt with love affairs. The book in question here contains selections from three of his works, the "Amores', the 'Art of Love' and the 'Cures for Love'. There were others left out of this collection. The poems presented are good in parts but nowhere even approaching great literature. 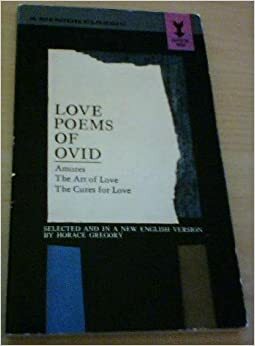 Ovid seemed to take himself as some sort of 'expert' on love affairs, the getting into them and the getting out of them. That and the detailing of the psychological manipulation practiced in what makes Rome seem like a gigantic pick up bar. He's quite proud of his accomplishment, but the repetition gives it a 'sameness' that one might get from listening to a braggart talk of his pickups in our time. It also comes across as the height of triviality and boastfulness. Perhaps the author would play better if a reading was restricted to a very few of his poems or, alternatively, if the full corpus was presented. This selection doesn't work very well. Certainly there are flashes of insight into human motivation, but nothing very great. His devotion to his 'Corinna' often comes across as cloying and exaggerated. The gloating over sneaky past husbands seems quite juvenile. So... is this a 'must read' book ? Definitely not. Its greatest virtue is that it is short enough to digest in one sitting.